While I was on a two-day job cooking for a family, I learned this great sandwich from a fellow chef. Since tomatoes aren’t in season yet, this sandwich is an updated version of the classic BLT, using pancetta, champagne mangoes, and basil. Simple, fresh, clean, delicious! Separate the pancetta slices and lay on the prepared baking sheet. Bake in the oven for 20 minutes or until crispy. Remove from the oven and keep warm. Meanwhile, peel the mangoes and slice into 1/4 inch thick slices. Toast the bread if desired. 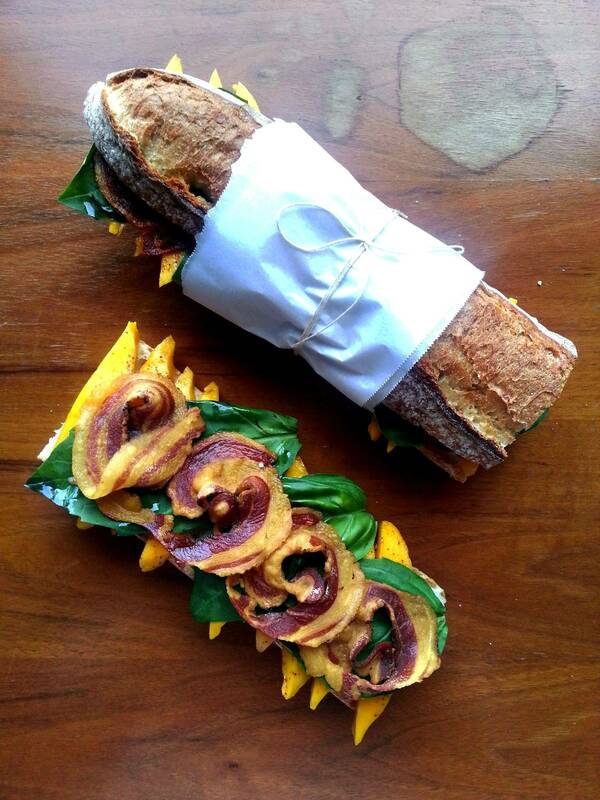 To assemble the sandwiches, cut the baguette in half horizontally. 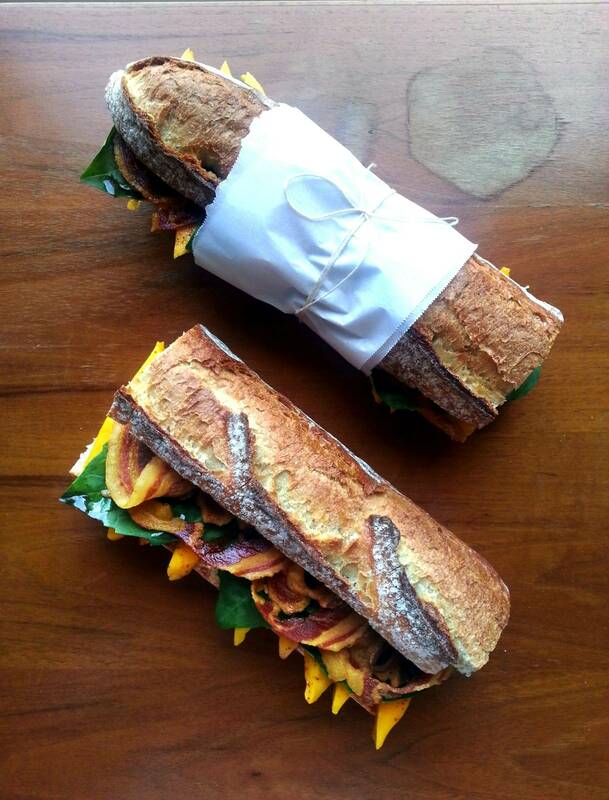 Lay the mango on the bottom of the baguette. Sprinkle a dash of cayenne on top, followed by the basil leaves and then the crispy pancetta. Top with the other half of the baguette. Serve immediately. Champagne mangoes also go by other names including honey mangoes, manila mangoes, and atauflo mangoes. They are much smaller than the common mango and have a creamier texture. If you never had one before, I highly recommend that you try them, even if you’re not a huge mango fan. This recipe is as simple as they come. 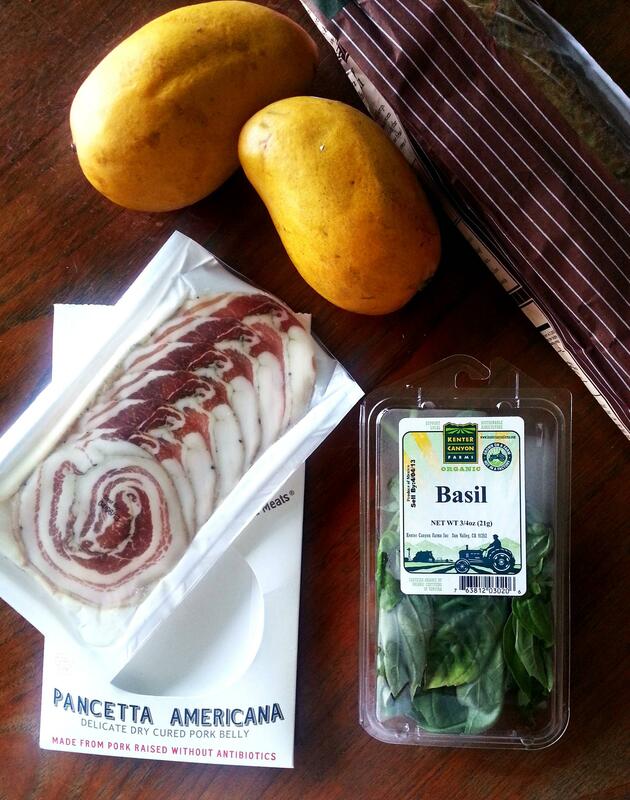 Sure you have to cook the pancetta, but other than that, it’s just a matter of putting the ingredients together; and there are only 5 ingredients! Now you may be wondering why there are no condiments in this sandwich. 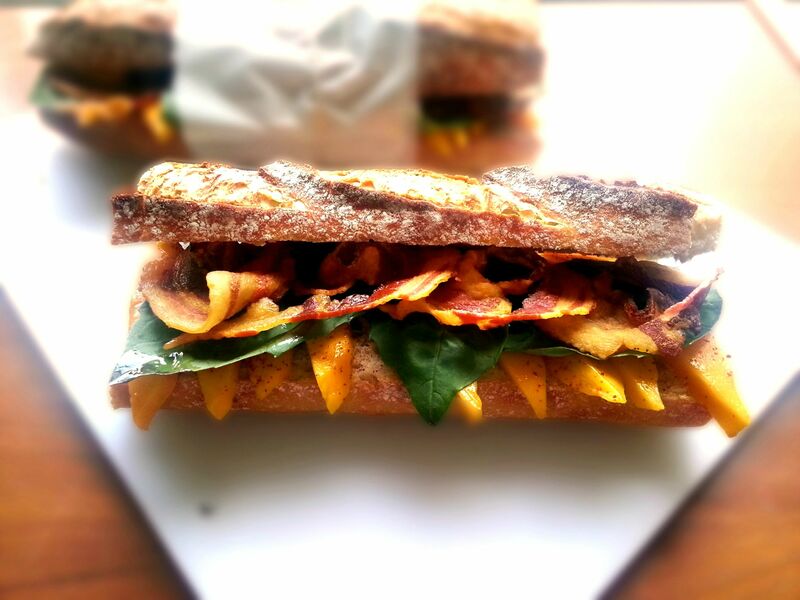 Truth be told, the mangoes are so creamy that they act like the condiment, preventing the sandwich from being dry. When I made this sandwich for myself, I was very much pleased with the combination of the flavors. 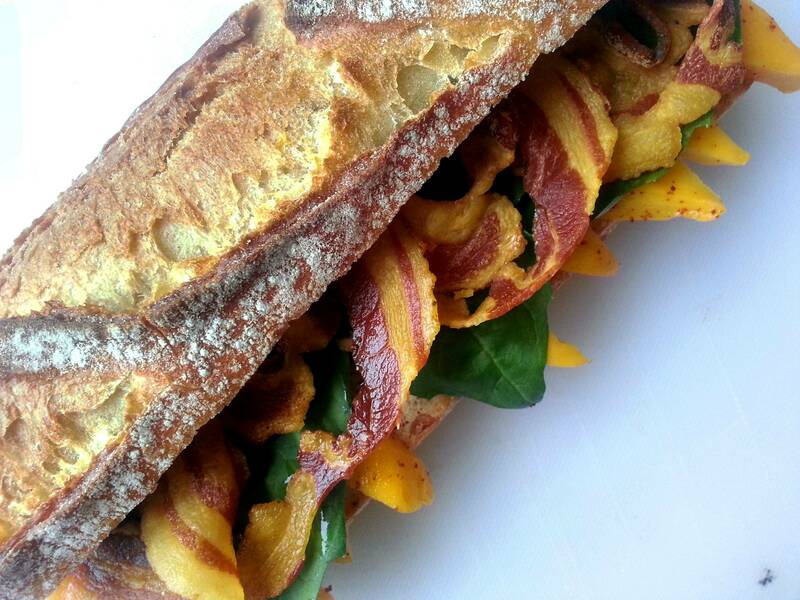 The creamy, sweet mango played with the salty, crispy pancetta, while the basil gave a nice herbal freshness to the sandwich. If the baguette is too much bread in relation to the fillings, you can choose to remove some of the inside bread. 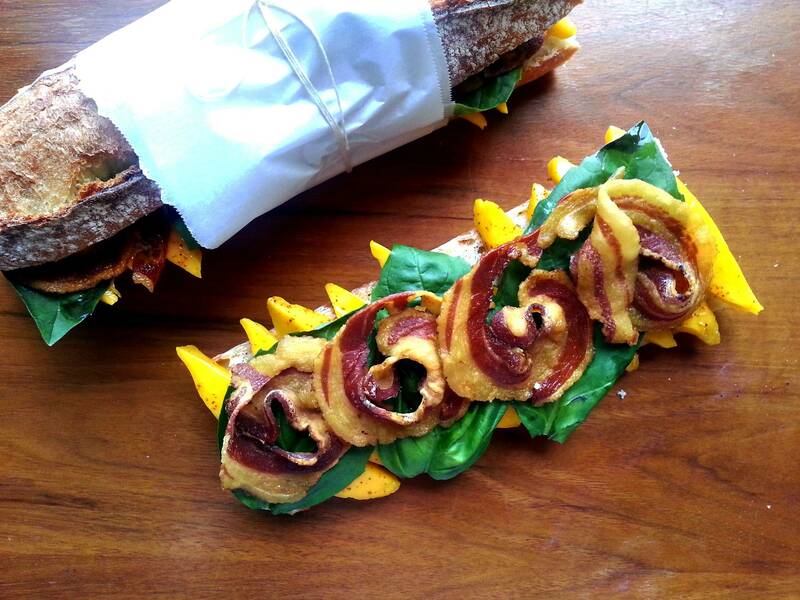 A very nice gourmet version of the BLT!